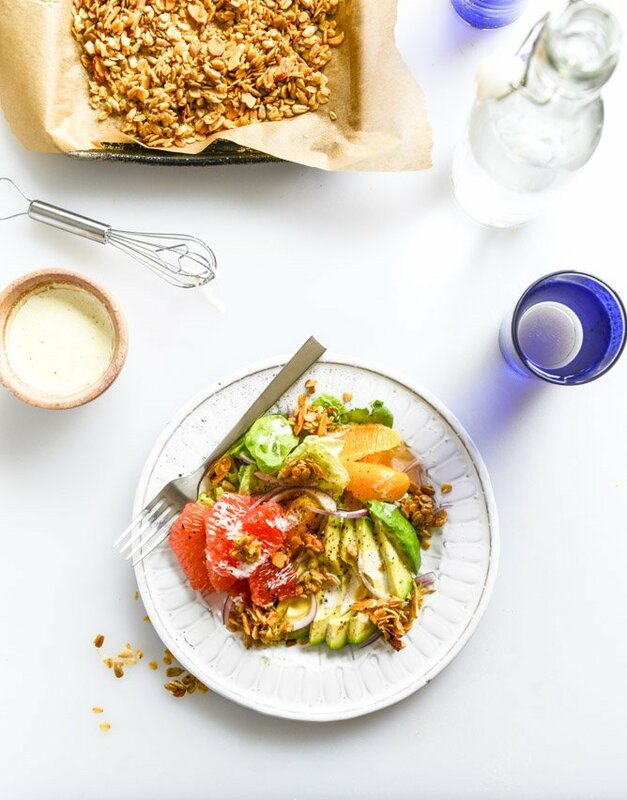 Avocado Citrus Crunch Salad with Oat Croutons and a Buttermilk Drizzle. Lessons by salad, first edition. Lesson one: it’s never too late to combine a bunch of weird junk on top of lettuce and call it a salad while everybody looks at you wide-eyed, annoyed and half excited. While it may never be too late, it MIGHT actually be too late because if you eat something like this while watching the Walking Dead season finale, well… I shall not say more. Lesson two: anything on greens negates whatever it is that is being put on the greens. So like. You want to slice up your pizza and put it on greens. You should. Cut a cheeseburger in half! GREENS. Unless it’s additional vegetables and then in that case you get bonus points for life. To use towards (toward?) all things. 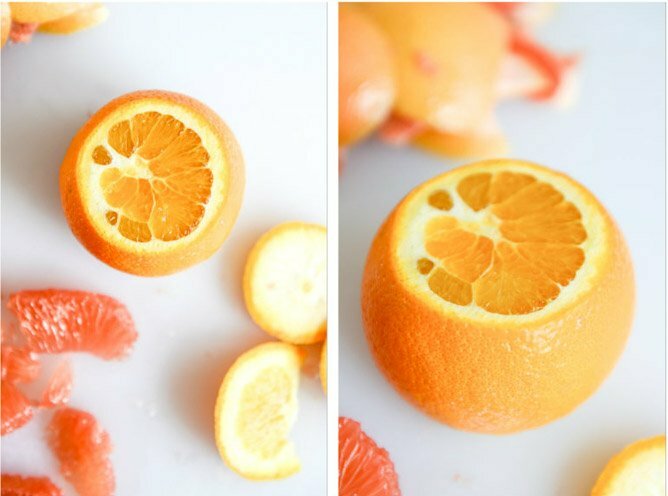 Lesson three: I can’t segment citrus to save my life. Oh no siree. And I don’t even want to. But I probably should. To learn patience. Because apparently it will always be important and I will always need it and rarely have it when I need it. Lesson four: oat croutons made life worth living last week. All puns aside, I am totally nutty over these oat croutons. Okay, so they are really just oat clusters. Clusters of oats, if you will. So what? We have a salad and well, calling them croutons just sounds so palately appropriate. AND. Donna Hay called them croutons in an issue last fall and I’ve been dreaming of them ever since. Like… what kind of salad can I use these oat croutons on? She puts them on a caesar salad. I’ve already made a bunch of caesar salads. I needed something else, something seasonally appropriate. I mean, oat croutons. With garlic slices and toasted almonds and sunflower seeds. Oat croutons, are you even real? Huh. What else is on this salad? A black pepper buttermilk drizzle. That is slightly new for me, because I don’t really love black pepper. I enjoy it when it’s finely ground (boring) but I can’t handle big fat peppercorns. But but. Here, it’s just a little drizzle with some tangy makeshift buttermilk dressing. The combo is fantastic. The remaining salad guts consist of a ripe avocado (praise heaven! ), super thinly sliced red onion and some crunchy but soft butter lettuce. Have I ever told you how much I love butter lettuce? Yes. I have done so a million times. It’s my favorite of all the lettuces. I’m sure that comes as no surprise though. It’s my salad maker of choice even though in real life I often force myself to do things over spring greens so I feel better about things. And also get nutrients, I guess. So yeah, there is a lot going on here but it… works. Sweet and tangy and spicy and crunchy. This salad is one big mish mash of winter going into spring but spring still pretending that it’s winter. Which I don’t really love but, whatever… I’ll just eat this instead. 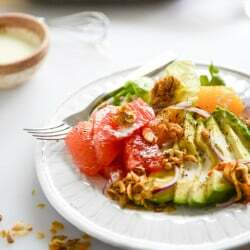 Add the lettuce, avocado, grapefruit, orange and onion evenly on to two plates. Season with salt and pepper. 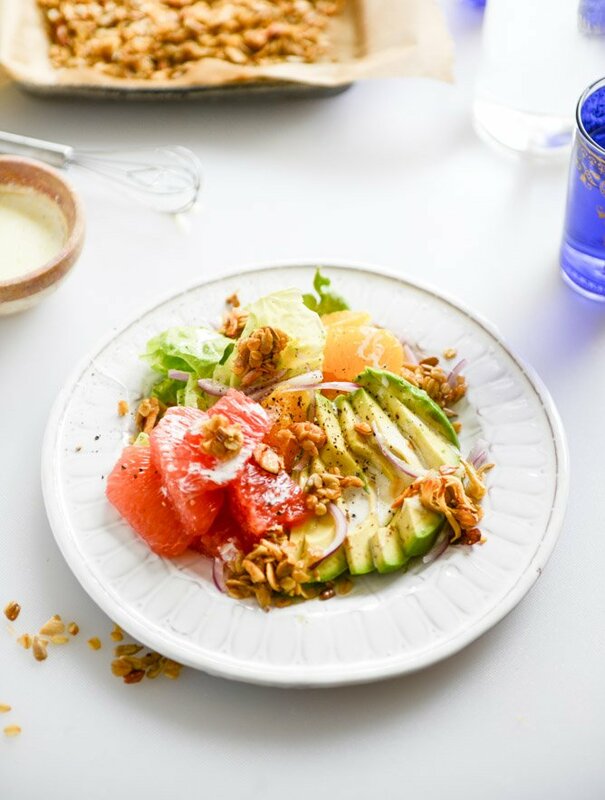 Drizzle the buttermilk dressing over top and sprinkle with the oat croutons. 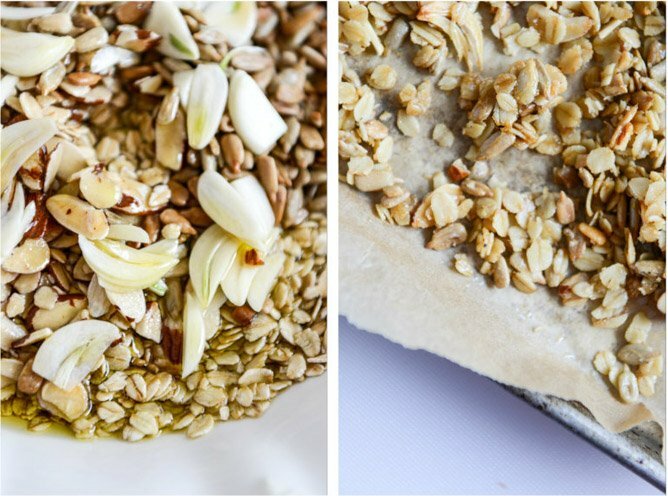 In a bowl, combine the oats, seeds, almonds, garlic slices, salt and pepper. Mix well. Add the syrup and olive oil, tossing well to coat until everything is moistened. Spread the oats out on a nonstick baking sheet and bake for 15 to 20 minutes, tossing occasionally until golden and brown. Remove the sheet from and let the oats cool completely. Once cool, break into pieces and chunks. Sprinkle on salad. Whisk all ingredients together in a large bowl until combined. Drizzle over salad. You make me want to subscribe to Donna Hay’s magazine. I just went to her website and her pictures are to die! I made this salad last night and it was fabulous! A light refreshing dinner with just the right amount of ingredients and still filled me up. I was so intrigued by the interesting combination of flavors that I had to try this, and I am definitely glad I did! It was quick to put together as well. I could have eaten the oat mixture by itself; very tasty! 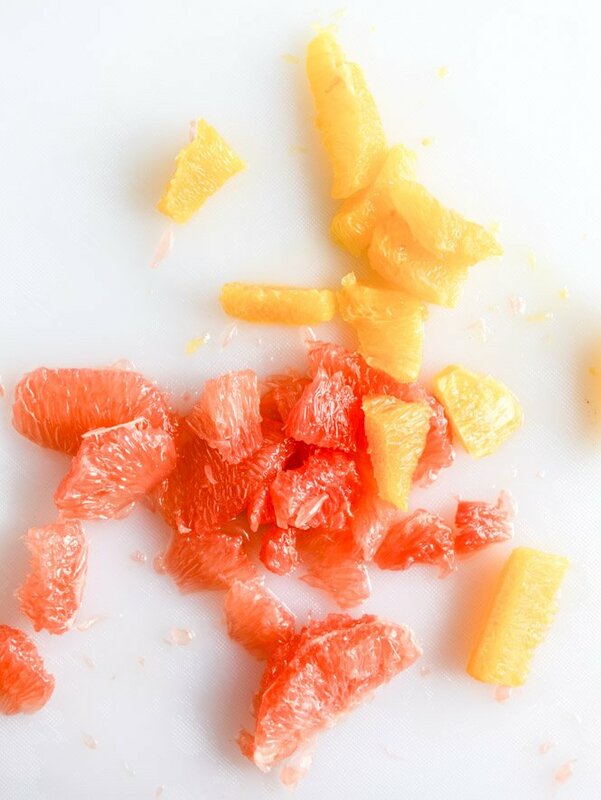 It gave the salad a little bit of sweetness to balance out the grapefruit and orange. I was not able to find rolled oats so I used old fashioned instead and they didn’t clump up like I was hoping, but they still tasted great. I love the idea of oat croutons! I’ve honestly never been a big fan of croutons but these seem great! Yum! It’s uncommon for a salad too look so delicious to me! Pingback: W E E K L Y // 1 : Yes, I want cake. This salad looks so delicious – I love all the colors!